For Poetry Sunday, I am recommending "A Prayer For Old Age" by William Butler Yeats. I hope you enjoy it! 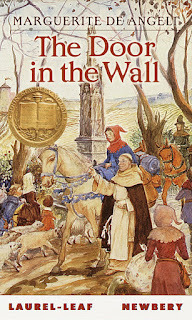 For MMGM, I am recommending The Door in the Wall by Marguerite de Angeli. Robin has grown up the son of a nobleman. He knows he must serve the king by becoming a knight. But Robin's destiny is changed suddenly when he falls ill and loses the use of his legs. A monk named Brother Luke rescues Robin and takes him to the hospice of St. Mark's. There Robin learns woodcarving and—much harder—strength and patience. When danger threatens the great castle of Lindsay, Robin discovers there are more ways to serve a king than riding into battle. As Brother Luke says, "Thou hast only to follow the wall long enough and there will be a door in it." Originally published in 1949, this book is set even earlier (the 1300s). Unlike some historical fiction, however, this book is short (about 120 pages) and to the point. The majority of the book revolves around Robin as he tries to regain function in his legs and also learns skills such as woodwork and writing, with the monk who found him alone and with no ability to move. The story has an especially current message, which is that even those who are disabled are still beneficial to the world and to others. This is reinforced by the end of the story, in which Robin helps save a castle by discovering useful information. 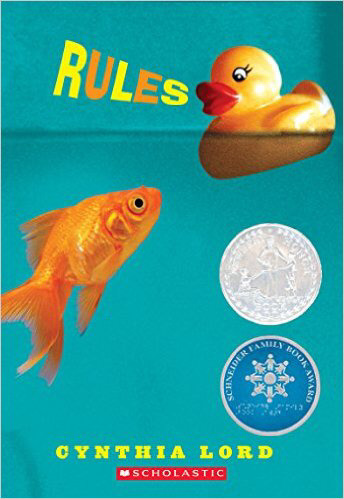 Unlike many Newbery books, this one is relaxing and calm, with no particularly sad moments. 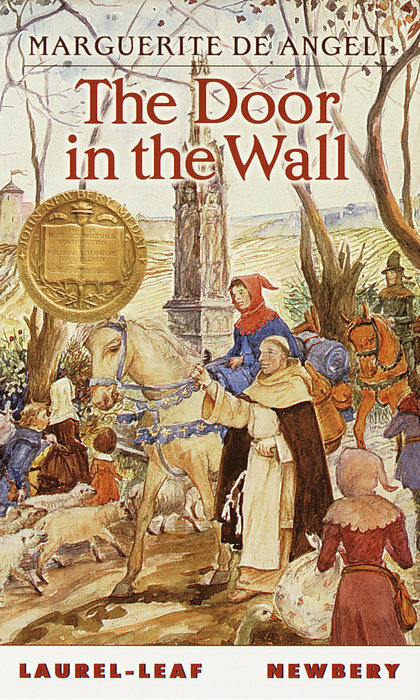 This is one of my favorite historical fiction novels of all time! For Poetry Sunday, I am recommending "The World Is Too Much With Us" by William Wordsworth. I hope you enjoy it! For MMGM, I am recommending Rules by Cynthia Lord. The main character of Rules (a Newbery Honor book) is Catherine, a 12-year-old girl whose younger brother, David, has autism. Catherine is often conflicted between trying to help her brother in the world and wishing that he could behave around others. In the story, set in summer, Catherine makes two friends, a girl named Kristi who moves in next door, and a wheelchair-ridden boy named Jason who cannot speak and must use cards with words written on them. All of these events culminate in Catherine's struggle between embarrassment and protectiveness, or between her and her brother. Catherine is a great narrator for the story, staying strong and likable as she deals with issues in her life. Kristi and Jason are great characters as well, and Catherine's conflicts as part of friendship with them are relatable to anyone who's ever had friends. Although an important part of this book is autism, unlike many other books about the subject, this one is not very sad, making it a particularly enjoyable read for any kid, class, or adult. 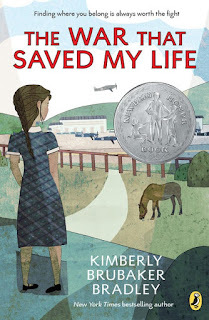 For MMGM, I am recommending The War that Saved My Life by Kimberly Brubaker Bradley. One of the most tragic yet overlooked problems in our world is child abuse, and, although The War that Saved My Life is set during World War II, this is simply the front for a saddening yet ultimately hopeful (and amazing) story. The main character, Ada, was born with a clubfoot (which is basically a disfigured foot). However, her mother never had the foot fixed, and she instead treated Ada as disabled, never letting her out of their apartment and often beating her or locking her in the "cabinet." Ada and her little brother, Jamie, end up leaving when their home of London is deemed unsafe and likely to be bombed, and they are given to a woman named Susan Smith, sharing the children's last name. This seems symbolic of the bond that soon forms, as Susan, although never having children or wanting to, grows to love the children, just as they begin to love her. Ada soon discovers what the world is like, and she is also conflicted, feeling at first like she is worthless because of her foot, which is what her mother ingrained in her, showing how abused kids cannot just easily decide that their parents are wrong. Ada eventually begins to become happier, learning to ride a horse and befriending several kids. Susan has her own problems as well, dealing with the loss of her best friend, roommate, and only real ally in the world. This book is so amazing that this review does not do it justice. Whether being read by a kid, a class, or an adult, it is incredibly touching, certainly deserving the Newbery Honor it has won. For Poetry Sunday, I am recommending "One Art" by Elizabeth Bishop. I hope you enjoy it! For MMGM, I am recommending Where I Live by Eileen Spinelli, with illustrations by Matt Phelan. Diana loves where she lives. She loves the astronomy charts on her walls and the fact that she can wave to her best friend, Rose, from her very own window. And best of all, a wren has recently made its home right by her front door! When her family is forced to move, Diana wonders if she'll ever find that same grounded and happy feeling again. This gentle and ultimately redeeming story in poems is about those secure and fulfilling friendships that happen naturally and easily when you live right next door, and the struggles of losing the comfort of a familiar place. 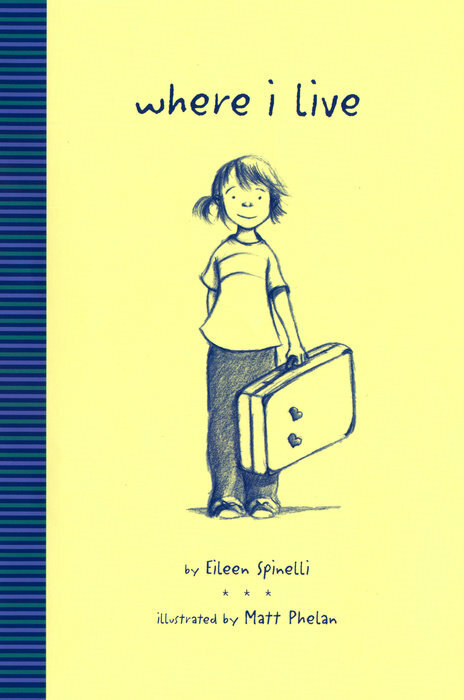 Matt Phelan’s warm and expressive illustrations perfectly complement Eileen Spinelli’s tenderhearted and unique tale that reminds us that sometimes a little uprooting and change is necessary for growth. This book is aimed towards the younger end of middle grade, but it discusses topics, such as moving, that everyone has to deal with. As the story shows just how much Diana loves her home, it also shows well how she handles moving into the home of her aging grandfather. Diana is a unique character with a great voice, written in verse. Diana writes poetry, which seems to make up the story and allows her to work through her feelings. The story never drags on, and it uses just enough words to convey its point, making it somewhat short. The story has a happy ending, showing that moving won't always be as horrible as it first seems. This book is great for anyone, regardless of age!